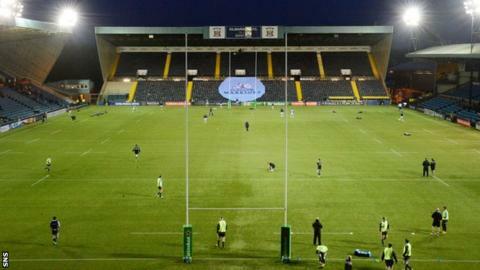 Glasgow Warriors have moved their Pro12 match with Munster to Kilmarnock's Rugby Park due to a "high risk" of the Scotstoun pitch being unplayable. The game will now go ahead on Friday 19 February. Warriors defeated Racing 92 on Kilmarnock 3G pitch in the European Rugby Champions Cup last month. "It's really disappointing that we have to move another fixture away from our home at Scotstoun," said Glasgow Warriors director Nathan Bombrys. Heavy rainfall over the last few weeks had meant the Scotstoun pitch has not been available for training or games since the match with Scarlets on 12 December. Over 6,000 tickets have already been sold for the match with Munster. "Despite ongoing work being carried out on the pitch, the heavy storms continue to flood the pitch, and there is a high risk that it will be unplayable for this fixture," continued Bombrys. "As Kilmarnock have a home game on the Saturday and we play the Dragons the following Thursday, our only option was to play the game on the Friday night. However, making an early decision to play this fixture at Rugby Park will hopefully help our supporters with their travel plans. "We are working with Glasgow Life and Scottish Rugby to get the pitch at Scotstoun playable as soon as possible and we're also in discussions with Glasgow Life, Scottish Athletics and SportScotland about a long-term solution at Scotstoun, which could involve a 3G pitch." Glasgow Warriors head coach Gregor Townsend added: "Unfortunately with the wet weather we've had recently our pitch isn't capable of hosting a game yet, but this is a great opportunity for us to play on an excellent surface."